Many thanks for the transcript ! Also I think obi wan’s phrase’s about truth and viewpoint are probably very relevant here “you’re going to find that many of the truths we cling to depend greatly on our own point of view.” / “The truth is often what we make of it; you heard what you wanted to hear, believed what you wanted to believe.” This is definitely true I think in this case and as the transcript and your notes suggest - there is more to it they are not telling us . You are very welcome!!! And yes...indeed! @TheBastardofMandalore, What is that picture from? That's really cool. Also, to elaborate even more on this speculation, what if the FO is after this creature too? What if the giant beastie has the potential to be exploited for militaristic purposes like the Zillo Beast in TCW? We already know that the FO is interested in the Colossus as well. I can see the space pirates playing both the FO and their other (possible) wealthy clientele. Pirates are always vying for the bigger payout. It’s a screenshot from the extended trailer for Resistance that dropped back in August I think. It’s the beast that appears to be attacking the station. When the Chelidae were in the water (posing as the children, so that the First Order presumed they were dead based on slow vitals), they did not seem too concerned to be in the water. 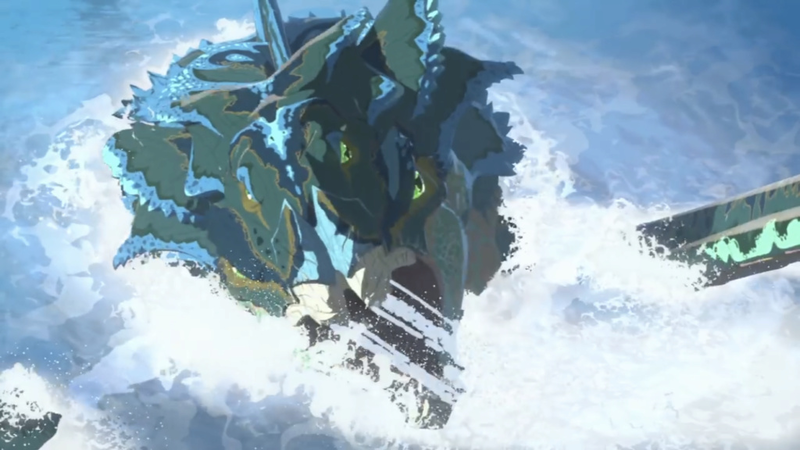 Therefore, either this beast is unknown to even them, or there is a symbiosis/peace, and indeed...something agitated it for the attack we will soon see in an episode or 2 (maybe 3)...I think there are three more at most with this season. Thank you! Oh my, I guess I must have missed that! It is interesting though, because in the early episodes when they tell Kaz he's going to crash during the race with Torra, and when Kaz is worried about getting tossed over the side by Aunt Z's goons, he is told there are things in the water that eat people. And yet as @SW_Heroine_Journey points out, the Chelidea didn't seem concerned, nor was anyone freaking out when Kaz kept dropping machinery into the ocean that had to be fished out. I always thought the pirates were attacking the Colossus because the FO ordered it to them, so they could negociate with Doza. The mystery here would be why the FO need controls over the Colossus. In the last episode, we learnt there is military junk in the water (why? I wonder), so maybe the FO need to retrieve something important on this planet without rising suspicion. They insisted longer than necessary on kyber crystals but that is my feeling. Also, now Synara is a scavenger, so we have a planet under the FO's eyes + a scavenger + people escaping from him, so where he's the Kylo Ren. Also, congratulation, the serie passed the Bechdel test with Tam and Synara, and I'm rather curious to see how their relationship is going to evolve. I suppose Synara is going to leave the pirates to join Tam's group, maybe we'll know more about the FO/pirates deal. However, I prefered the previous episode. 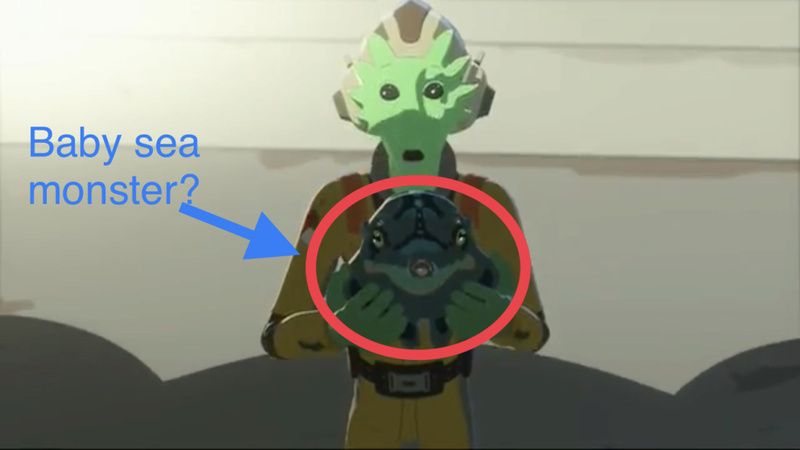 It had a new droid, a lot of droid humour and now Kowakian monkey-lizards are the Gremlins of the SW universe. My favorite scene is when Poe shot his blaster to scare a monkey-lizard but actually killed one. Kaz and the monkey-lizard's faces were hilarious. Yes, the mention about kyber crystals was definitely emphasized a couple of times, the scavenger parallel of sorts. Maybe when the empire fell, like Jakku, bits fell into the ocean/planet that need collecting? And I think there will be a bit of a back and forth thing with Synara but would be nice to see her side with Tam/Kaz. I was checking Clairen45's tumblr, and she reblogged an item indicating that there is a new voice actress for Leia's voice, after the last one became controversial. 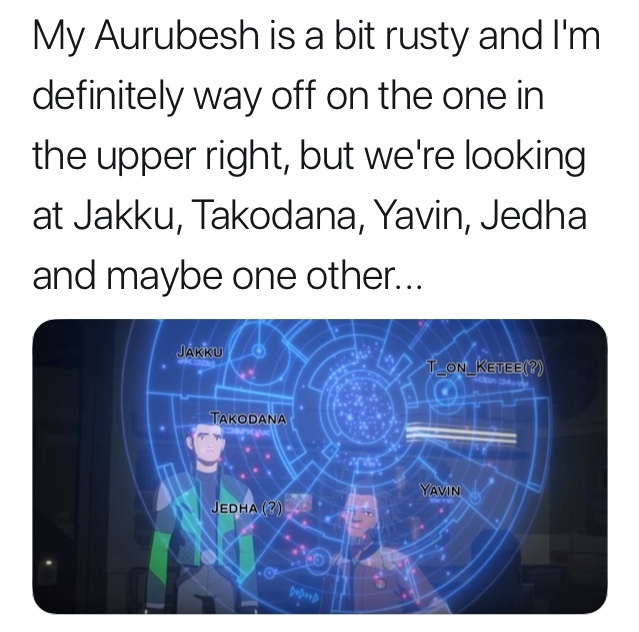 per antbee17 "Just wanted to give a heads up to those that watch Star Wars: Resistance or that can’t watch it but are following along with the show. I don’t think it’s a spoiler to say this since she appeared in the trailer, but the voice of General Leia Organa is now done by Carolyn Hennesy, https://www.imdb.com/name/nm0377321/. (It doesn’t say it yet on her IMDb page; although, it does say she does the voice of General Organa for LEGO Star Wars: All-Stars, but I checked on the credits to see and it says her name.) So for those that were wondering how the show was going to handle the situation, yes that other actress was replaced, so if that was a concern, you’re good to watch it now." @TheBastardofMandalore, I think our sea monster shows its tentacles in this preview of the second half of the season! I wonder if all the commotion is over this creature, pirates, the FO attacking the Colossus, or maybe they hear news of SKB... But I guess most likely the shots in the promo are an amalgam of all the major action over the various episodes. Awesome! Thanks for the share! You're welcome. I am really looking forward to this show starting up again. It wormed its way into my heart! Well, it appears we may know the monster’s motivation for attacking the station. Its baby was stolen it looks like. I’m betting the animal smugglers. I think this is what Torra was referring to in the trailer when she said “If you don’t make things right, it will destroy the entire station.” She’s telling Kaz or Team Fireball that they need to find and return the baby. Well, it appears we may know the monster’s motivation for attacking the station. It’s baby was stolen it looks like. I’m betting the animal smugglers. I think this is what Torra was referring to in the trailer when she said “If you don’t make things right, it will destroy the entire station.” She’s telling Kaz or Team Fireball that they need to find and return the baby. Good catch! That sounds very likely, and very much like a plot for a cartoon. Another promo trailer for the second half of the season. The action seems to taking a serious upward spike! Holy Sith !Omg! I got shivers down my spine watching parts of that trailer . It’s gonna get dark . Also noticed it’s been renewed for second season . Yaay ! Can’t wait to watch it. I know, I may have squeed a little bit when I saw the General Hux footage (sounded like the original Gleeson sound byte!) ...I'm excited that we're finally getting into the TFA timeline overlap! OMG! Yaaay! The second half looks so exciting. I’m glad it was renewed for another season...Fall 2019! I can't wait to see how much crossover there might be with Episode IX--which of course would have to be the second half of next season. But still! To me it's so exciting seeing what else is happening in the GFFA while the Skywalkers are dominating the spotlight. I totally got goose pimples, with the cross of over of Hux and the eventuality of the Hosnian Cataclysm. Sheeeeet.....exciting! Okay! That’s it! Time for me to buy resistance and start watching! Thanks for keeping us all updated everyone. Who hoo! Disney/LF really wants to avoid spoilers on the social networks if they have delayed the premiering on the streaming services to...I am guessing...~ when the episode airs on The Disney Channel/Disney XD. The last episode "The Core Problem" was set the day before Poe and BB-8 were to leave for Jakku, so yes, I'd say that with "The Disappeared", the timeline is going to start overlapping with TFA. The show has gotten really good, IMO. I'm looking forward to the last few episodes of the season. "The Core Problem" was set the day before? Eek...I feel ditzy I missed that. lol I really shouldn't have been ??? this morning, when "The Disappeared" was not there this morning. And then when I didn't see it on Google Play, I thought hmm...and then I saw Twitter posts pleading for no spoilers, and I thought...hmm...Disney/LF agrees with the pleas...to reduce the chance of spoilers, everyone is going to have a chance to see it all at the same time (or maybe the streaming services will have them shortly before). (Just checked again)...Thus far, still not on Disney Now.